After a neck-on-neck race, the Chocolate Temptation prevailed! I can imagine how just the name did it for most of you. 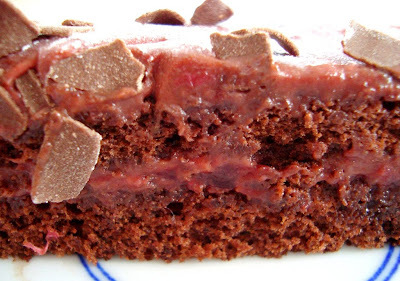 The Chocolate Temptation, or Tentation in French, is a chocolate-raspberry cake. Adapted from Ladurée, it is a 3-layer cake that is saturated with multiple fillings. I converted the cake into 2-layers, just to make it easier. The fillings are: 1) a cocoa syrup (think of it as a hot cocoa), 2) raspberry jam 3) and a bittersweet chocolate ganache. 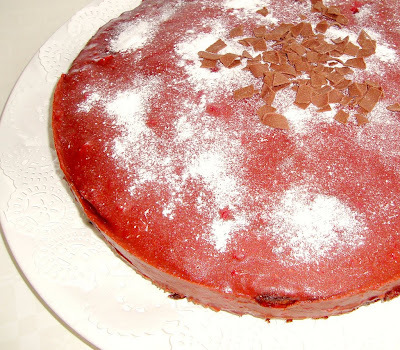 The cake is quite moist and filled with a deep chocolate & raspberry flavor. Dorie Greenspan calls this cake “the ooh-là-là dessert”; I can’t really say it’s “ooh-là-là”-inducing, but the cake was quite nice. Rating: 4- out of 5. - To make the cake: Center a rack in the oven and preheat the oven to 350 degrees F. Butter a 9-inch springform pan. (I used 2 9-inch pans) Sift together the cocoa, flour, and potato starch and set aside. 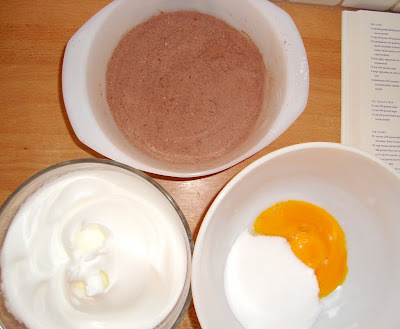 - Working in a mixer fitted with the whisk attachment, beat the egg whites until they hold soft peaks. Still beating, ad ¼ cup of the sugar in a steady stream, and continue to beat until the whites are firm but still glossy. - In a large mixing bowl, beat the egg yolks and the remaining ½ cup sugar together with a whisk until well blended and smooth. Switch to a rubber spatula and stir in one-third of the beaten whites to lighten the batter. Next, gently fold in the melted butter, followed by the sifted dry ingredients. Finally, working with a light touch, fold in the remaining egg whites. - Scrape the batter into the pan, slide the baking sheet into the oven, and bake for 35 to 40 minutes (mine needed 30 to 35 min), or until the cake is puffed, springy to the touch, and just starting to come away from the sides of the pan. Transfer the cake to a cooling rack and, after 10 minutes, remove the sides of the pan. - To make the syrup: Put the water, sugar, and cocoa in a small sauce-pan and bring to the boil, then lower the heat and simmer for 10 minutes. Remove from the heat and cool. - To make the filling: Place the chocolate in a heatproof bowl. If you have fresh raspberries, purée them in a blender; you should have about ¾ cup purée. Put the purée in one small saucepan and put the heavy cram in another; bring both to a boil. When the cream is at the boil, pour it over the chocolate. Wait for 30 seconds, then, using a whisk, stir gently until the chocolate is melted and smooth. Gently whisk in the hot raspberry purée, followed by the butter. The ganache is now ready, and it should be used within about 15 minutes. - To assemble the cake: Wash, dry, and reassemble the springform pan. Bring the raspberry jam to a boil; remove from the heat. - Using a serrated knife, carefully cut the cake into 3 even layers. Place the bottom layer cut side up in the springform pan and moisten it with cocoa syrup (the cake should be very moist, but not wet). Spread a very thin coating of hot jam evenly over the cake. Finish this layer by pouring over one-third of the ganache. Continue building the cake this way – cake, syrup (don’t worry if you don’t use all the syrup), jam and ganache – placing the last layer of cake cut side up and pouring the last third of the ganache over it. Chill the cake for at least 12 hours, preferably overnight, covering it with plastic wrap once the ganache is firm. - To glaze the cake: Put the chocolate in a heatproof bowl. Bring the cream, sugar and water to a full boil, stirring to dissolve the sugar. Pour the hot cream over the chocolate and wait for 30 seconds, then stir very gently with a whisk to melt the chocolate and smooth the glaze. - Take the cake from the refrigerator and remove the sides of the springform pan. It’s up to you whether you leave the cake on the pan’s base or remove it. Place the cake on a cooling rack over a parchment-lined rimmed baking sheet and pour over the glaze. Using a metal spatula, smooth the glaze across the top of the cake and around the sides. If you are using raspberries, place them on top of the cake. Slide the cake into the refrigerator for about 15 minutes to set the glaze. If the cake is very cold (as it will be if you’ve chilled it overnight before glazing it or kept it in the refrigerator after glazing it), allow it to remain at room temperature for about 40 minutes before serving – the flavors are more intense when the cake is less cold. The main ingredients for the cake. 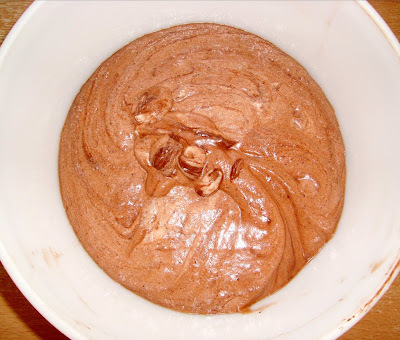 Delicious, very lickable, chocolate batter. 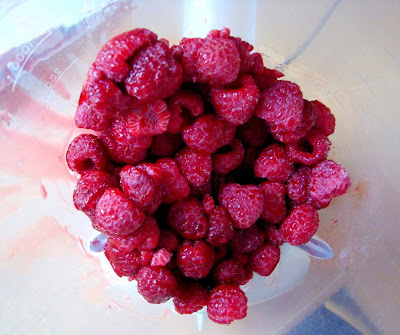 Thawed raspberries in the blender. 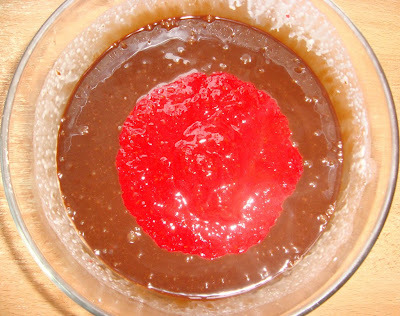 The raspberry purée combined with the melted chocolate: match made in yummy-heaven! Ladies and gentlemen, may I present to you a snow-topped Chocolate Temptation! I think it's pretty cool that the ganache turned out to be a burgundy red. Sounds like a winning combination of flavours to me - yummo! It looks like it tastes amazing with the raspberry chocolate combination. It also looks very moist. Yum. LOL my post this week is about not overindulging but reading your blog makes that terribly difficult- this looks delicious! 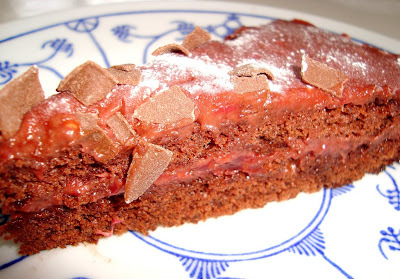 Raspberry AND chocolate - this looks wonderful! Have really enjoyed all your fabulous food, and looking forward to another year of winning recipes. Merry CHristmas to you and your family (I know it will be a delicious one)! This looks like a REAL temptation! I'm certainly trying!!! Wow, looks so rich and decadent! Yum! What a sweet (and lovely) temptation this is. Oh my, this looks heavenly! You're such a brilliant baker! Sounds and looks lovely. I voted for this one and stand by the choice. Great job! OMG, that sounds amazing. I'm up for anything that's infused with raspberries!